A revised and updated English paperback edition was published by IB Tauris in 2018. Aleppo lies in ruins. Its streets are plunged in darkness, most of its population has fled. But this was once a vibrant world city, where Muslims, Christians and Jews lived and traded together in peace. Few places are as ancient and diverse as Aleppo one of the oldest, continuously inhabited cities in the world successively ruled by the Assyrian, Persian, Greek, Roman, Arab, Ottoman and French empires. Under the Ottomans, it became the empire’s third largest city, after Constantinople and Cairo. It owed its wealth to its position at the end of the Silk Road, at a crossroads of world trade, where merchants from Venice, Isfahan and Agra gathered in the largest suq in the Middle East. Throughout the region, it was famous for its food and its music. For 400 years British and French consuls and merchants lived in Aleppo; many of their accounts are used here for the first time. 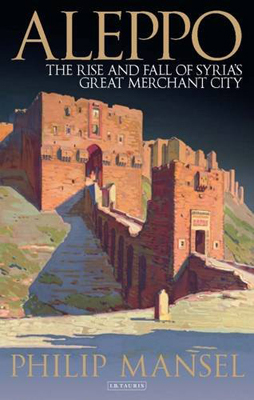 In the first history of Aleppo in English, Dr Philip Mansel vividly describes its decline from a pinnacle of cultural and economic power, a poignant testament to a city shattered by Syria’s civil war.